Ivanovets is a Project 12411 Molnia missile boat designed for destruction of enemy warships, transport and assult vessels, terrorist groups in the sea and in the bases; protection of ships and vessels from surface and air attacks. Missile boat R-334 (serial number 211) was laid down at Srednenevsky Shipyard on April 4, 1988; put afloat on July 28, 1989 and commissioned into Black Sea Fleet on December 30, 1989. R-334 renamed into Ivanovets on October 29, 1998. 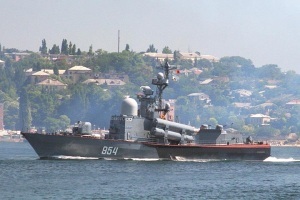 Ivanovets is included 41st brigade of missile boats based in Karatinnaya bay, Sevastopol. Patronage agreement between 41st brigade and Ivanovskaya region government is accomplished in November 1998. - Capt 3 Rank Lopatko V.A.